Mr. L.E. Cooke (1964 photo) built his business on quality and service. "My little order is too small to be of any concern for you..." is one of the most un-true statements we ever hear from potential customers. The L.E. Cooke Co is a family business, run by family members who value the efforts you put into your business. Our core business is built around serving other independent nursery businesses of all sizes with quality bareroot stock. The First Generation with Mr. and Mrs. L.E. (Ted and Edith) Cooke started in 1944 in San Gabriel, California. Mrs. Cooke was partners in a retail nursery/florist when Mr. Cooke (1906-1968) started brokering plants from Oregon. He took orders from local nurseries, drove a truck to Oregon, returned and stored plants in a greenhouse at their home to be delivered later. This service grew to cover all of Southern California then expanded to Arizona, New Mexico, Texas and Oregon. The hard work and great service by 'Ted' Cooke made him a friend to most all his customers. 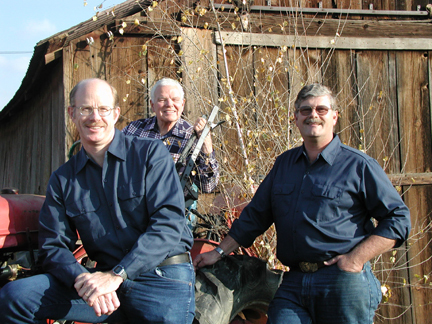 Ron Ludekens, Bob Ludekens, and David Cox. The Second Generation with Bob Ludekens (son-in-law) began in 1946 while Bob was still in high school. He went away to UCLA in the early 50s, graduating in business, then working three years as a professional Boy Scout Leader in Los Angeles. Bob returned to L.E. Cooke in 1956, became General Manager in 1962 and majority owner in 1965. He bought out his partner in 1992. He has remained active in Scouting throughout his life and promotes the values Scouting teaches in business and in life. In the 1950s growing fields were started in Escondido in partnership with John Wyatt. In 1956 a field was developed under the power lines in San Gabriel, 1957 in La Puente, 1958 Wasco, 1959 Porterville and Hanford. 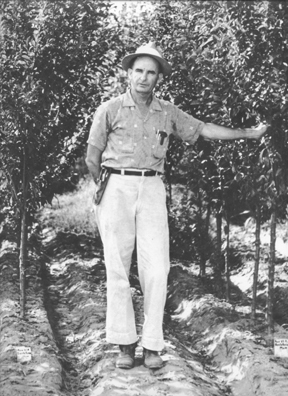 In 1961 growing operations began at Visalia in partnership with skilled and beloved grower, George Daniels. Visalia became the focus of operations when the current office was built in 1965 on 20 acres of newly purchased land. Today we farm over 1,250 acres both owned and leased. All acreage is within 4 miles of the office. The future is very much in the hands of the Third Generation. David Cox (Bob's son-in-law) has been with the company since 1976. He is currently CEO/General Manager supervising all production while keeping involved in accounting and computer systems. Ron Ludekens (son) grew up with the business, spent 16 years in management with Westinghouse before returning in 1990. He is President over marketing, sales, the Supply Division and production planning. Bob continues to visit the nursery each day, but most of his time is spent training leaders to run Boy Scout Troops and Cub Scout Packs which he continues to start up across the County - especially in areas experiencing gang problems. The Fourth Generation is already taking leadership roles in the company. Phillip Cox, David's son, has joined the company with multiple roles by covering several sales territories, managing the budwood/scion wood orchards and virus certification program and overseeing the engineering of infrastructure for the vastly improved irrigation systems. Today, we deliver to most U.S. states in full truck loads at favorable rates. We ship in excess of eighteen 53' truck loads into Ontario, Canada plus more into Quebec and British Columbia. We have become the nation's major grower of Persimmons, Pomegranates, Jujube (Chinese Dates), weeping mulberries (75,000), flowering apricots, Umbrella Catalpa, tree Altheas and are well known for redbud selections, walnuts, pecans and many other unique selections. Over 95% of our sales are to retail and wholesale nurseries and landscapers where quality and wide selection counts. Our family, devoted office, sales and production staff work hard to provide you with the quality products and service you need to be successful. Let us know how we can assist you.